Zoologists Dr Cathy Byrne and Dr Simon Grove, and Tasmanian Herbarium botanists Dr Gintaras Kantvilas, Dr Miguel de Salas, Matt Baker and Lyn Cave were among an elite contingent of Australian taxonomists who spent ten days exploring the island’s main nature reserves, participating in the national program’s quest for discovering new species and procuring fresh specimens for museum collections. Others Tasmanians among the group included honorary TMAG researcher Dr David de Little, snail expert Dr Kevin Bonham, dragonfly and butterfly researcher Abbey Throssell, TMAG zoology volunteer Laura Sherman-Hayes, and James Wood and Natalie Tapson from the Royal Tasmanian Botanical Gardens. Bug researchers from the Australian Museum, Professor Gerry Cassis and Jackie Karras, as well as Queensland Museum spider expert Dr Robert Raven also took part in the survey. Despite being so late in the season, the days were mild and the evenings exceptionally warm, and the BushBlitzers found plenty of plants and animals to keep them all very busy for the duration, including many species endemic to Flinders or the Furneaux group and some species new to science. The expedition was based at the cabin park in Whitemark, but by working in pairs or small groups and with a small fleet of four-wheel drives, the island was combed from one end to the other and from sea-level to mountain-top, taking in woodlands, rainforest, heathlands, dunes and wetlands. Dr Cathy Byrne spent most of her evenings operating light-traps for what was sometimes an overwhelming number of moths, including several belonging to undescribed species. Dr Simon Grove discovered that spotlighting for beetles could be as productive as daytime hand-searching and trapping, and his beetle highlight was finding at least three species of Lissotes stag-beetles, at least one of which appears to be confined to wet forest on the high slopes of Mt Strzelecki and is probably undescribed. Many other beetle, insect and other invertebrate species of great interest were found that will also usefully fill key gaps in TMAG’s collections. 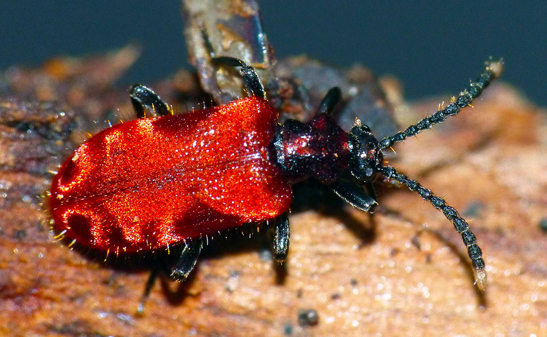 After a slow start, Dr David de Little procured a good range of the leaf-beetle species on which he specialises, including specimens that looked more like mainland Australian species than Tasmanian ones. 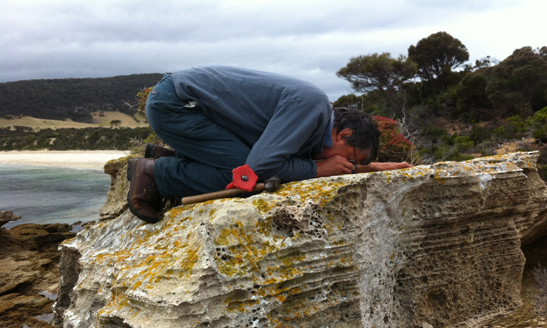 Dr Robert Raven was over the moon to discover that amongst the spider finds were some elusive, primitive mygalomorph spiders whose long-suspected presence on Flinders he had been very keen to verify. They will now be a priority for formal description. Dr Kevin Bonham found all 16 species of native snail that had been previously known or suspected to occur on Flinders, and then added a couple more to the list, probably representing undescribed species. Dr Gintaras Kantvilas' haul of some 200 lichen specimens looms as many hours of hard work at the microscope before they can be identified and lodged in the collection. However, one species likely to be new to science has already been identified from the summit of Mt Strzelecki, and also of particular interest will be the numerous tiny crustose lichens collected from coastal limestone stacks. Lyn Cave braved leech-filled gullies to collect close to 200 bryophyte specimens (mosses and liverworts), and while much of the island's bushland is very dry and offers little in the way of bryophyte diversity, the Strzelecki National Park area is home to a good range of species. Even the summit of Mt Strzelecki has a good growth of bryophytes between rockplates, and under shrubs, because it is often topped with moisture laden cloud. Matt Baker was pleased to find relatively few weed species within the surveyed parts of the reserves, however the same can't be said for the developed parts of the island where many herbaceous and shrubby weed species can be found. Propagules from these weed 'reservoirs' outside of the reserves and the threat of disturbance inside the reserves from fires, recreational activities and feral animals, such as pigs, could easily change the balance between introduced and native plants. Of particular interest to Matt was surveying the only known Tasmanian population of the beach weed Arctotheca populifolia on Planter Beach on the east coast of the island. Dr Miguel de Salas collected over 250 plant specimens from all the major vegetation types around the island, and of particular interest was the wet gully behind Mt. Strzelecki, which contains every known Tasmanian species of filmy fern (Hymenophyllaceae) in the space of only a few acres, and Bob Smith's Gully, which has one of the few known populations of the small fork fern Tmesipteris parva. Now it’s down to the hard and meticulous work of sorting samples, processing specimens, identifying them and selecting new species to describe – a process that can take many, many months. 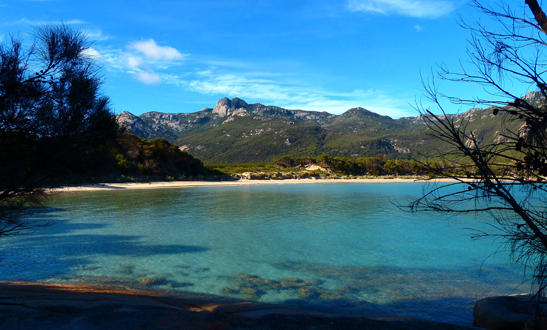 The Flinders Island Bush Blitz followed directly on from the successful survey on Tasmania’s Central Plateau, and after a productive – and exhausting – few weeks in the bush, the researchers will now take time to work on their discoveries from both surveys.